Enjoy an al-fresco breakfast, whatever the weather. A mug of hot chocolate, pastries wrapped in a linen tea-towel, and a good book, will ensure the very best start to the weekend. Create an autumn wreath with foraged finds. Decorating our homes with natural treasures needn’t be limited to Christmas. Spend the evening star-gazing. Search for a local event, or simply grab some blankets and find a comfortable spot in the garden. Listen out for owls while you’re there, too. Plant some bulbs for the spring. Daffodils, snowdrops or tulips are easiest, and if you don’t have a garden, why not plant a few for someone who does? Try out wild swimming in a lake or river – just make sure you wear a wet suit! Go for a walk every day for a month, and try to go a different way each time. Often, we ignore what’s on our doorstep for places further afield, so this season embrace your locality. Research and read up on the history of your local area. Fittingly for autumn, many counties have books on local ghosts and spectres, so curl up and immerse yourself in bygone worlds. Autumn is a brilliant time to learn something new, as we naturally have that ‘back-to-school’ feeling that comes from childhood. This year, why not try a traditional craft? Pottery, willow weaving, wood turning and blacksmithing are all making a comeback, so for once, join the crowd. Create your own seasonal story. Whether it be through writing, photographs or drawings, take inspiration from the natural world and document the seasonal changes taking place every day. Turn off the lights and burn a few beeswax candles instead. Better for the environment, and you’ll create that cosy atmosphere that lends itself to this time of year. Get foraging for blackberries, mushrooms, elderberries, sloes and cobnuts. Just make sure you know what you’re looking for, or join a local foraging group or course. Preserve your bounty and make some jams and cordials to last through the winter. You’ll need a basic jam-making kit and a kitchen to yourself, but the rewards are so great, you won’t regret the time it takes. Get outside and have a wild camping micro-adventure, just for the night. Make sure you layer up and check where it’s legal to pitch your tent. Go wildlife spotting. Wildlife Watch have handy sheets to help, so if you’re taking little ones, why not make it into a wildlife hunt? November is… crunching your feet on the first frost, hearty casseroles, being thankful, the flutterings of bright lights and bonfires, reading in front of a roaring fire and misty mornings. Dates for your diary: Stir-up Sunday (26th). On the final Sunday of November tradition dictates that it's time to make your Christmas pudding, making sure to give everyone in the family a chance to stir the mixture and make a wish. Head over here for a foolproof recipe. Unearth your slow cooker and try this sausage and bean casserole, or go veggie and opt for this vegetable stew with dumplings. Plant some bulbs for the spring. Daffodils, snowdrops or tulips are easiest. Turn off the lights and burn a few beeswax candles instead. Be creative: Although you can buy advent calendars for pennies, I always think it's much more exciting to make your own. My sister and I used to make each other a calendar each year, and would make little gifts for each day; it took us forever to construct but it gave us so much joy each December morning that it was completely worth it. THIS POST IS A CONDENSED VERSION OF THE MONTHLY NEWSLETTER I SEND OUT TO SUBSCRIBERS. DON'T WANT TO MISS OUT ON THE NEXT ONE? SIGN UP HERE! I reside in Cornwall which means Autumn reaches us last at the very edge of the island. Although summer has waned and I’ve already witnessed my first blood red full moon of the season, there’s still enough warmth left to bask in the shallow shores in our swim togs and enjoy the beaches all to ourselves. The trees are just about beginning to fade and the first scattering of acorns have dusted our woodland floors. Last weekend, I drove North to the edge of the Peak District and it enchanted me to feel as though I was plunging further into real autumn, to see the trees become increasingly burned gold and red as I travelled, the leaves dancing serenely down. With the autumn equinox behind us now, we have passed the period marker of when the length of the days are equal to the nights; what lies next is the observation of Samhain, the beginning of the chapter of darkness and night. Don’t despair, it’s not as grim as it sounds; for the night is exciting and the approaching phase on the calendar is one of fire and warmth. The tradition of observing Samhain is well kept in modern culture and today is more commonly referred to as ‘Halloween’ or ‘All Hallows Eve’. Although Samhain predominantly marks the beginning of the winter in the Celtic calendar and celebrates the beginning of the ‘period of darkness’, there are the well-known, altogether more mystical associations which have been translated over to other religions that also observe this festival. I’m sure you’ve learned this from cultural osmosis in one way or another, but it is believed across the faiths that the 31st of October is the night when the veil between the spirit world and ours is the thinnest, that spirits can walk and dance among us. On the British isles, it was the Pagan Celts that began honouring their dead with Samhain; lighting candles, bonfires and holding feasts wearing the skins and bones of the animals sacrificed for the festival thus beginning the tradition of disguise and dressing up for the festivities. While death is perhaps the largest theme of the Samhain festival, there is nothing morbid or satanic about the celebrations; modern pagans do not believe that death is something to be feared, but it gives way to birth and new beginnings. The festival is not only one of marking a shift in the natural calendar and physical changes in the earth but one of respect and joy in celebration of the lives of loved ones and a time to reflect on things that have come to an end, be it relationships, jobs, friendships, chapters and other significant life changes. It’s a time of making peace and new beginnings. Cast yourself back into the Samhain of the Celtic Pagans; their druids built enormous bonfires which were sacred and their fire was shared with the village and used to light the bonfires of their homes throughout the winter, protecting and warming the villagers. Feasts were shared together in these communities with music and merriment. As the veil between the two worlds, corporeal and spirit, was seemingly dissolved, the druids thought that the spirits of their ancestors could help them to predict the future and so fortunes would be told. For the Celts, the transition into the new phase on the wheel of the year did not begin at dawn but instead at sunset, with darkness. As the final harvest of the year has been reaped, the seeds (symbolic of the gods) go back into the earth for the winter period to be reborn at Yule. It is considered that as the seeds are plunged back into the deep, dark loamy soil of the land, the sun king travels the underworld, learning and gaining wisdom before his re-emergence at Yule time with new ideas and knowledge. It is symbolic that during this period of darkness, we reflect and take stock, find inspiration, create and birth wonderful new dreams and ideas. The winter phase is a time for dreaming. Have you ever wondered what the significance of apples at Halloween is? In Celtic-Pagan lore, apples are a sacred fruit and a symbol of life and immortality. A Celtic tradition was to bury the apples at Samhain which would provide food for the souls waiting to be reborn. Another symbol of Samhain is the besom-broom, traditionally made with birch things to represent purification and renewal. The motions of sweeping away the autumn leaves and cobwebs not only efficiently clears away the house, but ritually clears away old energies making space for the new; another symbol of rebirth. The word Samhain translates as ‘Summer’s end’ and comes from the gaelic language. It was known under other names across the various Celtic regions, for example; ‘Nos Galan Gaea’ in Welsh which means ‘Winter’s Eve’. But Samhain isn’t the oldest festival nor the only festival where the Pagan Celts believed to have elements of ‘magic’ and the ‘mystic’ - May the 1st in fact holds much more prominence in the early Celtic calendars across the British Isles. Today, the festival has since been absorbed and adopted by modern faiths and culture and has become a vibrant mix of traditions and influences. One thing is for sure and that is the theme of the spirit world merging with our own still influences our celebrations of the Halloween festival and although it may not be the skins and skulls of animals that the revellers choose to wear, the enthusiasm for disguise and dressing up has endured and is certainly one of the key components of modern Halloween. So maybe this Samhain you’ll be lighting a candle in memory of lost family or relationships, bobbing for apples or even hitting the town for a night of wild antics dressed up as an exceedingly scary bunny rabbit. Regardless of whether you believe that the spirits are dancing among us that evening, there’s no denying that Halloween is an exciting festival of whimsy and enduring harmless tradition (as long as you’re not sacrificing anything more than a few five pound notes at the bar.) It marks the beginning of a season filled with roaring fires, listening to storms rattle the windows, putting on the most comfortable of woollen scarves, lighting deliciously scented candles while nestling down under thick blankets with your loved ones and indulging in seasonal hot drinks liked mulled cider and spiced coffee. I think personally, that’s as good a reason as any to celebrate. Apples are synonymous with autumn. The first that twists and breaks free so crisply from its branch is always a delight, and marks the start of the new season in the orchard. Blossom flowers that graced the trees so elegantly in spring give way to robust, round fruits that will be baked into pies, pressed into cider, or simply devoured to the core. Humble though they may appear, apples are representative of many seasonal pleasures, not least the act of preservation and preparing for the cold winter months ahead, something which in our modern society we seem to have lost. The apple has rejected its Roman associations with luxury, and has become an everyday fruit for all seasons – “an apple a day keeps the doctor away” – rather than a food to be relished at its peak. If you want to be sure of when this is, simply take note of the date for Apple Day, a festival introduced by the arts and environmental charity Common Ground in 1990. On the 21st of October, annual celebrations take place throughout the country, with activities ranging from the stalwart apple identification (there are thought to be over 7,000 varieties!) to apple printing, mummers’ apple plays and poetry evenings. The festival has come a long way since its Covent Garden stallholder origins, and is now celebrated in over 600 locations, from village halls to botanical gardens to the Houses of Parliament. Surely, then, the only way to preserve this local distinctiveness, is to make a conscious effort to embrace all varieties of apple, and in particular those local to where we live? If that’s in or near London, then Borough Market boasts the perfect celebration: a lively family festival that offers apple-hungry visitors the chance to taste apple varieties and other products such as preserves, breads, pies and juices – proof that apples don’t just have to just be a snack-on-the-go, and offering more fuel to their versatile fire. Last year visitors also took part in the apple-peeling competition and enjoyed the boisterous tale of The Fabularium’s Reynard The Fox. Further north, many villages host smaller festivals, and The National Trust offer activities for children at many of their properties. Apple Day is not just about the produce, but also about drawing together as a community. How will you celebrate? This piece is an extract from an article in issue 1 of Creative Countryside magazine. Find out more and see further content here. It was always my aim to mark the launch of the magazine with a seasonal supper. And just over a week ago we gathered to celebrate autumn, and the first print issue of Creative Countryside magazine. Family and friends arrived to wish me well, but there were also many creatives that came, some I'd never met before, and the eclectic mix was perfect for the informal occasion. Sarah, Creative Countryside's Nature Editor, also visited with her lovely family, and stayed the night in our bell tent. It was wonderful to meet them all, and to be able to exchange stories and ideas throughout the evening, and the following morning. Spiced mulled cider (homemade from our apple orchard) was handed out as guests arrived, and candles flickered on every available surface. Though it wasn't a warm night, we opened the back door and lingered outdoors, relishing the cool air and warming our fingers around the mugs of cider. 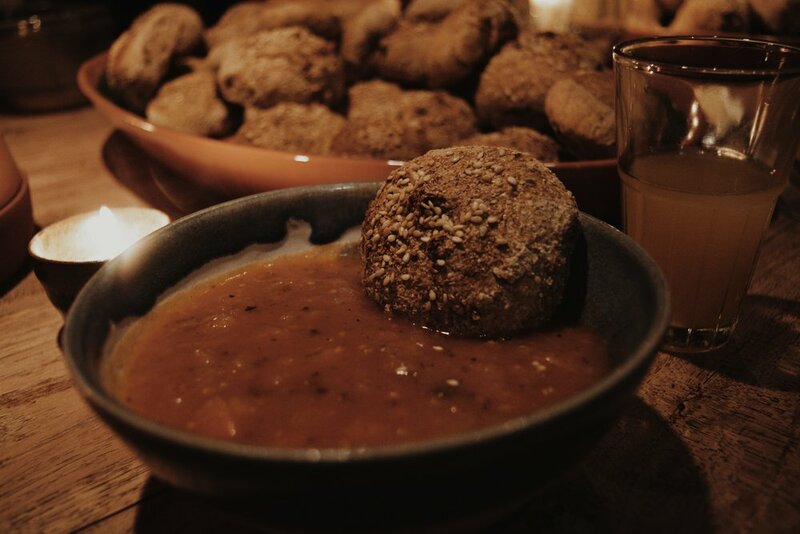 Handmade bowls were filled to the brim with autumnal soup, the beetroot, potatoes and squashes picked only the day before from the veg patch. Homemade spelt and sesame seed buns completed the dish, which was followed by an apple & ginger bake, and apple, redcurrant jelly & cinnamon tarts. Eating seasonally is so important in our family's life, and it was wonderful to share a suitably autumnal meal with like-minded others. I managed to say a few words before handing out gift bags and magazine packages, snatching swift conversations with everyone who attended. Some subscribed there and then, others took home a copy after flicking through the ones on display. After most had gone home, I realised that the stack of folk music I'd selected to play remained untouched; conversation had rendered it unnecessary. All the gift bags had gone. We had to raid the storage boxes upstairs for more copies of the magazine as we sold out downstairs. My husband asked me later if I thought the evening had been a success, and though I was almost afraid to say it out loud then, looking back seems to suggest it was. October is... squashes of all shapes and sizes, leaves turning golden and falling in clumps, winds that nip your ears, the end of harvest season, and a time for bonfires. Did you know? Apple Day is nearly upon us! Celebrate this humble fruit on October 21st by attending a celebration, or get creative and make an autumnal display using seasonal fruit and other finds. Dates for your diary: October 31st isn't just Halloween; it's also the ancient festival of Samhain. Check back later in the month for Sarah P's post on how to keep this celebration, or grab a copy of the magazine to read Sarah H's take on the day. Bring out the blankets and stock up the logs ready for those colder nights. Make seasonal displays with foraged autumn finds. Try out this homemade cider recipe - it's so easy and you can make as much or as little as you like! Have a go at foraging and then with your bounty make a simple hawthorn berry jelly. Drop some oil into a large pool of surface water. Watch as it slowly bleeds and swirls, dispersing, yet unable to be truly absorbed, accommodated. It moves slowly, yet purposefully; expansively: and that is the very same image I can see before me, as I gaze up at a gloom September sky, that moves like an unearthly liquid. I can’t ascertain whether it is cloud, rain or merely haze, but the sky pulses today, as it licks over the embers of slowly dying moorland. And despite this movement, the air feels listless and lifeless; barren, devoid, empty. And it is the loss of the swallows, that provides the punctuation on this thought. Only a few weeks prior, the sky overhead was a chalky blue, washed with soft white clouds that drifted aimlessly and happily through cool evening air. Against this sheet music, the graceful arcs and sweeps of swallows played out a natural music for the eyes; an orchestra of flight, grace and silent triumph. But today, an emptiness. An absence that is felt, in ways weightier than the lightness of their presence. I wonder where they are; what they are doing? Whether they ever think of these fields, and the hours they spent sweeping over them? I think of them, here, and now. I gaze across fields that transition into moorland, and lament their loss. My legs take on their own rhythm, and I slip into a gait that is comfortable and effortless. Today, it is my eyes that are doing all of the work, drinking in every last vestige of what once was verdant. Summer is over, and autumn is here. Yet I always feel that autumn never truly ‘arrives’; this beautiful season is far too transitional to remain still, or stable, to definitively arrive. The grasses that sprang forth from lichen-covered walls with such verdant energy, are now yellow, white and brown. Leggy, tired, defeated: I can relate. How strange, as they hunch and bend over themselves. Such weightless things, yet the stalks of spent energy now appear to carry an invisible force of great magnitude. Their swansong is as stark as the clouds that gather above my head. I see a piece of wood that is too large to be labelled a twig, or indeed, a stick, and yet too small to be described as a log. It is covered in the most wonderful greenish and blueish lichen – veritably covered – and has the appearance of scales; a snake of the most exquisite delicate patterns and textures. I run my hand across it and marvel at the beauty of its cool sensation. I continue on my way, and take heart from the various ferns that protrude from dry-stone walls. Autumn is a time of visual and visceral decay, yet a thousand observations combine to form a unique beauty that is there for those that seek it with open eye and honest soul. Much as I prefer to wander through the fields and woods and wild places at this time of year savouring these early days of autumn, I’m the first to admit that I do appreciate a good herbaceous border. Indeed, I also appreciate the very relaxing Friday night routine that is a cosy corner, a cup of tea and the latest Gardener’s World. So of course, I sit and I watch Monty Don as he deadheads the dahlias and shows us the late summer delights of the ‘Jewel garden’, all rich oil pastel hues and dense emerald foliage beneath. 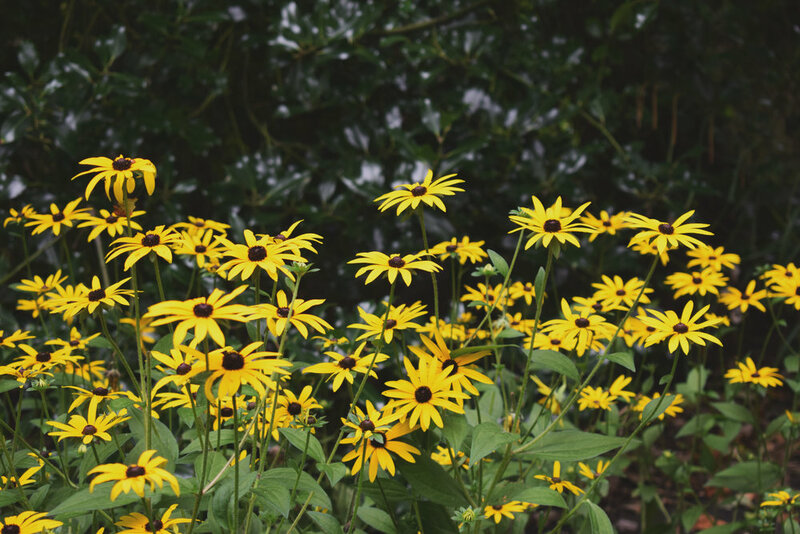 Sunflowers (my favourites are the rust and chocolate brown shades), rudbeckia, crocosmia, heleniums… Gone are the tasteful pale pinks and baby blues of May and June. Now the garden puts on its last spectacle of the year in fiery oranges, deep clarets, saffron yellows and velvety purples. These flowers are ‘painterly’; they remind me of oriental art and country house wallpapers, of painted china, Agatha Christie and the Bloomsbury set. Glamorous and decadent in both form and colour. Of course, many of these flowers have been grown in cottage gardens for generations, mixed in with the fruit and vegetables. My great aunt in Poland used to have an abundance of crimson-and-white striped dahlias growing in profusion amongst the potatoes and onions. Lilies too, all clashing together – tasteful colour combinations were not much of a priority in hard-working, productive plots. And yet there’s always something aesthetically pleasing about a jumble of mismatched dahlia stems, displayed together in an old jug on the kitchen table. The one painterly flower I’m a little bit snobbish about is the chrysanthemum. Back when I worked as a florist (a short-lived amble off my career track but memorable nonetheless), chrysanthemums were seen as an inexpensive ‘filler’ flower. Nobody bought entire bunches of them. There were, of course, the more expensive single stems, the ‘spider’ and ‘shamrock’ varieties which added a touch of the exotic. I can still smell the pungent leaves, crushed underfoot as we stripped back the stems to make hand-tied bouquets. For me, the one chrysanthemum I find hard to resist is the old-fashioned ‘bloom’ type: big, spherical, densely-petalled heads which look like they belong on a kimono. Bronze ones in particular (I’m incredibly – excuse the pun - picky about yellow flowers). Bloom chrysanths, in my book at least, have to be bronze. So: Yes to autumnal forest floors and purple heather moors. Apple and pear orchards, sloe-studded hedgerows. But there’s something very lovely about a brightly coloured allotment or public garden at this time of year too. It’s like seeing a firework display: short-lived but spectacular. I’m fortunate to have once visited the RHS Harlow Carr garden at this time of year. But I’ve also seen some truly lovely late summer displays in city parks and in local plots too. Even a trip to the garden centre to admire the colours and get some inspiration is well worthwhile before these painterly flowers go over, summer takes its last breath and autumn is well and truly upon us. It's finally (and officially) here. One of the four Solar Festivals, Mabon marks the move into autumn according to the Wheel of the Year. An equinox is technically an astronomical point, and as such the precise date can alter each year, though the autumn equinox typically falls between September 21st - 24th. The date represents a moment of equilibrium, as the day and night are of equal duration, and as such the concept of balance is key. We are in the middle of harvest, and it is a time to finalise late summer tasks before moving forward into the colder months. Plan to get out and about and experience the Equinox on the day whatever the weather. Gather with friends and family for a bring-and-share feast. Ask everyone to bring food and drink that reflects the season. Decorate the tables with vases of flowers, fruit, nuts and autumn leaves. Light candles with a dedication and thanks for the harvest of the year. Thanksgiving and balance are the twin themes of the Autumn Equinox. Seek to take the harvest you have gained in the outer world and integrate it with the turning within, to help bring clarity to the way ahead as the season changes from autumn to winter. Have some baskets of yarns, seeds, shells, string, sticks, fir cones, feathers, dried grasses, dried flowers, ribbons, threads, needles, scissors. Ask everyone to bring something and then sit together, weave, thread, bind, create something that reflects the abundance of the moment. It may be a necklace to wear, a headdress, an autumn posy to hang up, a special wand or totem. As you make it, think positively about what you are harvesting and how you can use this for your greater good and the greater good of the Earth. Reflect on the gains and losses of the year. Give thanks for the outer expansion and what has been possible. Look at what is no longer needed, and what it is time to let go of with thanks and blessings, as you release the past. Share with each other the seeds of your harvest that you take with you into the next cycle. Count your blessings. Celebrate your abundance. Plant some native bulbs or tree seeds in pots to place outside. Plant your own inner seeds with them. Focus on your hopes, ideas, and intentions for the spring and your allegiance to the Earth. Plant some of the fruit, nuts, seeds and berries you have gathered for the Autumn Equinox, label them, leave them outside without saucers underneath, and see what comes up in the spring. Glennie's writing also features in issue 1 of the magazine, which is still available to pre-order here. Today Head Chef at Colwall Park Hotel shares his foraging tips and a simple hawthorn berry jelly recipe. Don't forget you can win a 1 night stay for 2 (including dinner and breakfast) at the hotel if you select our Seasonal Package for the magazine crowdfunding campaign (which has already reached its first target!). You'll also receive a recycled check blanket, organic apple and cinnamon tea, organic dark chocolate, and a copy of the magazine (but be quick - the campaign ends on Wednesday 6th!). Foraging is exciting and very rewarding but can be very dangerous if done without doing your research. I am still a novice but find information through books and websites like foragedfoods.co.uk. There is great produce to be found and don’t forget it’s free! During the coming months I will be looking for produce in the local fields, hedgerows and not forgetting the Malvern Hills, bring the bounty back to Colwall adding some culinary twists and creating some flavoursome dishes. As the nights are shorter nature’s larder becomes less bountiful but there is produce out there. Hawthorn berries are best picked when they are most ripe, which usually means any time from now until the beginning of November. Hawthorns are dense and, unsurprisingly, thorny. The berries are red and fairly similar to rosehips in appearance. Foraging the berries can be time consuming as they often bring with them lots of stem when picked which need to be removed; however, the rewards can be delectable. Pick 700g of hawthorn berries. Remove the stalks and wash, then drain. Put the berries into a saucepan, cover with 850ml of water. Bring to the boil and simmer for 1 hour then mash up the berries. Strain the mixture overnight using a muslin cloth - this will keep the jelly clear, but do not squeeze just let the juice drip. For every 550ml of juice you measure out you will need 450g of sugar. Squeeze the juice of 1 lemon. Mix the sugar and lemon juice into a saucepan along with the hawthorn juice. Bring the mixture to the boil, stirring continuously until the sugar has dissolved. Now rapid boil for 10 minutes until the jelly has reached setting point. The setting point is normally around 105 degrees, you can carefully spoon a little mix onto a cool plate, leave for a moment then push with your finger to see if it crinkles or is set. Skim off any foam from the top of the liquid, and pour into sterilised, warm jars and screw on the lids. Tip: This jelly goes great with cheese! We’re approaching the time of year when, for centuries, farmers have harvested crops before the weather turns. At the end of summer we celebrate the abundance and the safe gathering-in of foodstuffs for both people and animals. Produce is stored ready to be used during the lean months; we make preserves in the form of chutney and jam. Fruits, herbs and vegetables are dried, canned and pickled. Meat and fish are smoked and cured. In these modern times few of us are truly self-sufficient or even approaching that. We have neither the means (outdoor space) nor the time to grow, tend, harvest, preserve and store. Few of us have a cellar, larder or pantry where we can keep large amounts of food. And there is little need. The vast majority of us live in, or near, towns and cities with ready access to supermarkets and independent food shops. And yet there’s something about gathering in which appeals. It could be a bit of light foraging, a dabble in jam-making. Because opportunities for this type of resourceful pursuit present themselves throughout the year. Seville oranges make a brief appearance during January and February, so a rainy afternoon marmalade-making session is the best way to take advantage of their fleeting season. Early summer brings elderflowers – and bottling the syrup means we can enjoy a taste of summer months after the leaves have fallen. So, what’s the appeal? Perhaps it’s part of the modern-day yearning to get back to simpler ways of living. Of being closer to nature and returning to living in accordance with the seasons. An almost primal desire to slow down, retract from the myriad of food choices we’re presented with all year round. Strawberries in December, green beans flown in from across the globe. It’s as though all these things have become workaday, no longer special. Walking past that patch of blackberries every weekend, stopping to check whether they’re ripening. To consider how much sunshine they’re getting. Estimating when they might be ready to pick. Thinking utilising them in various cakes and pies and crumbles and planning to keep a few empty jars aside. This makes food exciting: the anticipation, the rarity value. The we-only-get-this-once-a-year feeling. The actual gathering-in fulfils some deep instinctive need, too. The knowledge that you’ve collected what you need and in good time. You haven’t missed your chance. It’s similar to getting the washing in off the line just as the rain starts to fall. A sense of achievement, no matter how tiny. I love to read about how people live seasonally and harvest and preserve. There’s something comforting about the whole idea of late summer and early autumn gathering-in. It’s beautifully described in Laura Ingalls Wilder’s Little House series, where pumpkins, nuts and cheeses were kept in the attic and neighbours would swap produce with one another and celebrate the seasons. Over the next few months we’ll have some wonderful seasonal foods to go out and find: damsons, brambles, crab apples, the final wild strawberries and raspberries, elderberries, hazels and sloes. And for the more knowledgeable forager: fungi (wildfooduk.com has a great list of edible mushrooms, but always take an expert along with you). Gathering in isn’t just about food. There are seeds to be collected from the garden and kept in readiness for planting and propagating. In late summer and early autumn I cut dried allium heads, honesty, teasels and hydrangeas to display in the house. Sunflowers too; I almost prefer them when their heads are full of dark seeds and the petals dried and papery. So go ahead and pick, harvest, collect. Whether it’s a bilberry-picking trip on the moors or simply filling a paper bag with foxglove or poppy seeds, there are few things more simple – and satisfying – than gathering what’s ripe and making good use of it. September is the fruitful month. Full of almost-full-size squashes, apples picked straight from the tree, hearty homemade pies and soups galore, it marks a change in what we eat as the new season begins. The salads of summer are not completely gone, but sausages and roasted vegetables are much more likely to appear than salads and barbecues for dinner, and although they take longer to cook, the rewards are always worth the extra time. This month also showcases the best of the hedgerow. In place of the elderflowers arrive the elderberries, ripe for turning into a fruity wine. Or why not try your hand at jam making if there are blackberries still lingering between the branches? Leeks are also making an appearance this month, and are delicious in a vegetable gratin: lightly fry, then add to a dish with part-boiled potatoes and smother with a cheese sauce, remembering to top with breadcrumbs and pumpkin seeds before heating through in the oven. Finish with a plum crumble, and you’ve got seasonal autumn dining at its best.